The British are coming! The British are coming!! The British Wild Cards, that is. Aces, jokers, deuces, and a few knaves too. Oh, and an Irish guy as well. They will be here on June 28. That’s when HarperCollins Voyager has scheduled the hardcover release of the latest Wild Cards anthology, KNAVES OVER QUEENS, edited by yours truly (with the able assistance of Melinda M. Snodgrasss, as usual) and featuring all new stories by veteran Wild Carders Kevin Andrew Murphy, Caroline Spector, Melinda Snodgrass, Paul Cornell, and Marko Stross and newcomers Charlie Stross, Peter Newman, Emma Newman, Mark Lawrence, and Peadar O Gulian. The one is something new for Wild Cards: the first time that the British edition of one of the books will be published in advance of the American edition. 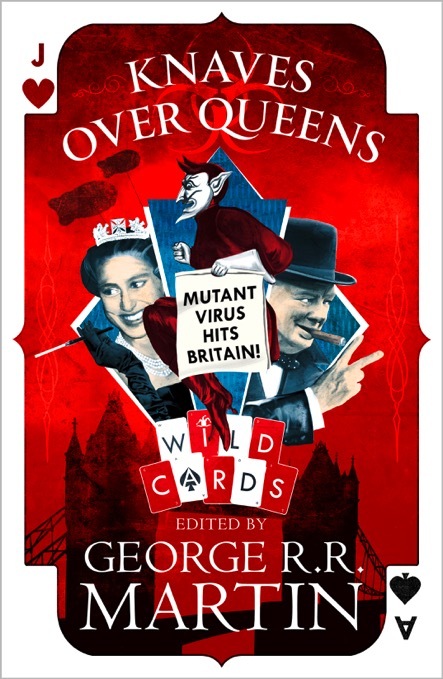 But it’s only fitting in this case, since KNAVES OVER QUEENS harkens back to our very first volume (WILD CARDS, of course), and tells the story of the entire history of the Wild Cards universe in the UK and Ireland, starting back in 1946 and going right up to the present day. June will be a huge month for Wild Cards, actually, since we also have LOW CHICAGO scheduled for hardcover publication that month from Tor, on June 12. LOW CHICAGO will be available only in the US edition, and KNAVES OVER QUEENS will be available only in the UK, so completists and first edition collectors are going to have a challenge (yes, there will eventually be a British edition of LOW CHICAGO and an American edition of KNAVES OVER QUEENS, but those will be a bit down the line). Fans of the Wild Cards universe will have a great time, though. Just thing of all those great new stories! Keep reading, friends. You can’t die yet, you haven’t seen the Jolson Story.